Employee Engagement And The Bottom Line! As businesses try to navigate the newly forming economy, one of the areas receiving a lot of attention is Employee Engagement. how “plugged-in” the employees are in a business. “soft, immeasurable, and nice to have issues”. workplace and motivated to be productive. • 54% were not engaged, meaning they were emotionally detached and unlikely to be self-motivated. • 18% were “actively disengaged”, indicating that they view their workplace negatively and were liable to spread that negativity to others. While this is interesting (and a little shocking! ), how does it relate to a business’ bottom line? It has been shown that employee engagement at the business/work unit level relates directly to each of the nine major performance outcomes, including turnover, absenteeism, safety, quality, productivity, and profitability. When business data in these areas was aggregated and ranked, dramatic differences were seen between the top and bottom quartiles. When comparing the top quartile to the bottom it was found that there was 37% less absenteeism, 37% less turnover, 49% fewer safety incidents, 60% fewer quality defects, 18% higher productivity, and 16% higher profitability. Another measure, Earnings per Share (EPS), also showed not only higher values in the top quartile, but greater stability as well. As business owners, we often focus our attention externally to the customer interface. We look at how a 1%, 5%, 10% increase in sales volume, close rates, customer retention, and customer satisfaction would impact the bottom line. impact on the bottom line from other than a cost viewpoint. What would happen to your bottom line if even a small percentage of your employees moved from “actively disengaged” or “not engaged” to full engagement? Improving employee engagement requires focus and commitment by the leadership level to actively listen, address and improve the dynamics within the organization. In reality, it is very similar to listening, addressing and improving Voice of the Customer issues. While maintaining focus on the customer interface is critically important to any business, placing some focus and attention on the internal organization and the dynamics that define it, can provide additional and much needed benefit to the bottom line. 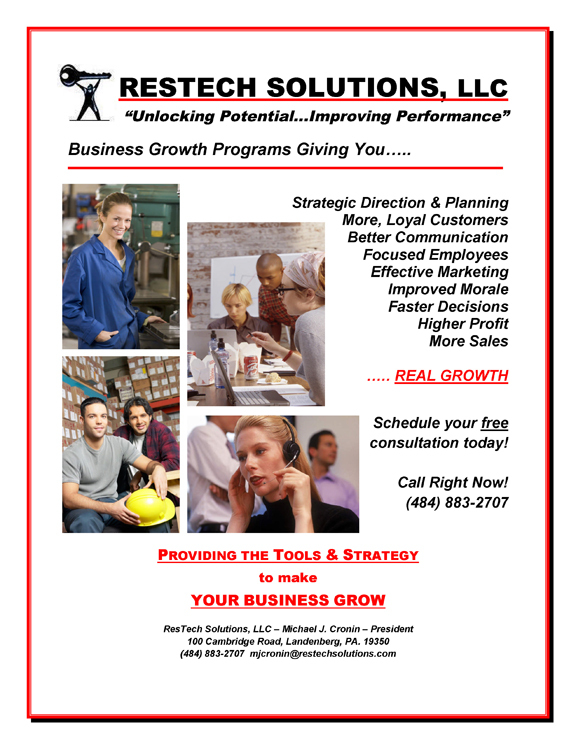 please contact Michael at (484) 883-2707 or mjcronin@restechsolutions.com. ← Previous Story Waste Not, Want Not!